Coworking space & hot desking office provider JustCo has eight locations in Singapore, including one at 120 Robinson Road. A concept created by JustGroup, JustCo offers vibrant coworking spaces that flexibly reach out to local and international businesses of all shapes and sizes. The customer base for JustCo coworking spaces & hot desking offices includes creative individuals, entrepreneurs, startups, and organisations of all sizes. Part of the how JustCo operates is to facilitate co-operation, based on the philosophy that working together means working better. To achieve this, JustCo offers you the space you need and the connections that will help your business grow. In other words, beyond the beauty and aesthetic design of JustCo spaces, the greater goal is to foster a colorful community of businesses that can fundamentally make work both enjoyable and friendly. 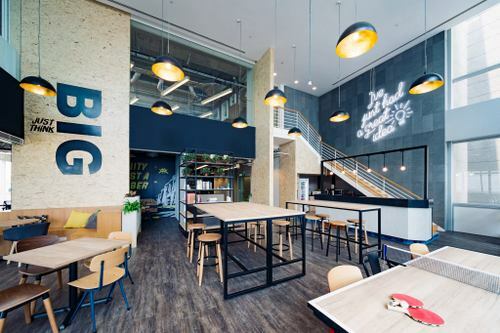 Of the coworking spaces & hot desking offices, one of the most interesting is JustCo @ Marina Square, which is estimated to house more than 1,000 members. The Marina Square location has a different concept from the other JustCo centres. For example, the place combines retail and coworking elements within the same space and community by having a marketplace where members and partners get complimentary booths to showcase their products. Another highlight on the company’s network of locations is JustCo @ 120 Robinson Road, where work and play come into perfect harmony over the stylish ping pong table and the old-school arcade and foosball machines. The more relaxed approach (and great views of the Singapore skyline) has attracted a large network of creative individuals, start-ups, and well known MNCs to JustCo @ 120 Robinson Road. The official Facebook brand page for JustCo Singapore is located at www.facebook.com/JustCoSG/. Following the Facebook page, you’ll receive updates about JustCo’s events, their promotions, and much more.